As a tilt-in-space chair, the manual wheelchair Invacare Solara offers durability, strength and adjustability in a clinically-beneficial package that adjusts to the users needs. This brings a comfortable, stable, and secure ride. With a 300 pound standard weight capacity, the Solara 3G features everything users loved about previous generations with the added bonus of an easier tilt and greater customization options. At Orthopedic Service Company, we are proud to work alongside global brands, such as Invacare, towards the mission of offering greater mobility and independence to our customers. The manual wheelchair Invacare Solara matches the user’s individuality to provide greater comfort and freedom of movement. Thanks to its improved technology and Tilt Assist feature, the manual wheelchair Invacare Solara 3G makes tilting easier by offering options that correct the uneven weight distribution normally caused by seating systems and other components. Along with a low shear recline, the Solara brings extra functional and clinical benefits to both users and their caregivers. 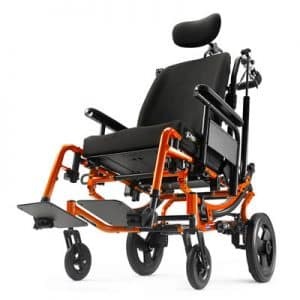 For greater security, the Foot Operated Wheel Lock of the Solara chair easily locks both rear wheels, while its optional DeGage Dynamic Rocker Back fits those with involuntary thrusts. A color coded, rust resistant zinc-plated hardware makes the chair more durable and its adjustments much simpler. The contracture footrest systems allow for great strength and adjustability. These and many other features make the manual wheelchair Invacare Solara a tilt-in-space chair capable of adjusting to its user’s body, lifestyle and requirements regardless of their ages and sizes. A pediatric option is also available. As the mobility experts that we are, we work hard towards providing our customers with the best mobility solutions out there. With our wide range of options, it can be overwhelming to choose one. But, part of our job is to get to know you and your specific lifestyle and requirements in order to find the right match. Give us a call today to learn more or visit our showroom to meet our mobility experts, who will help you in the search of the perfect mobility solution.